This new big wheeled Enduro racer and All Mountain bike is one of our dreams come true. The biggest and baddest bike in our range just had to go full carbon. With the whopping 150mm of travel in the rear and a massive 160mm fork paired with the 29” wheels this beast can roll over anything at any speed. But at the same time, the light weight, super efficient power transmission redefine the range of applications that one bike can have .Riders and press loved last year’s alloy Snabb 150 but the Define takes things to the next level. Apart from the gorgeous looks and weight savings that come along with the carbon frame, you get adjustable reach and BB height and practical, elegant semi-integrated cable guides. One of our favourite bikes in the range, the 29-er Snabb now goes carbon! The frame of this bike is not just a fancy version of the alloy workhorse. We worked hard to make sure we really are taking things to the next level. To start with, the industrial design was conceived by the guys who made the Eurobike Gold Award winning Rondo Ruut. 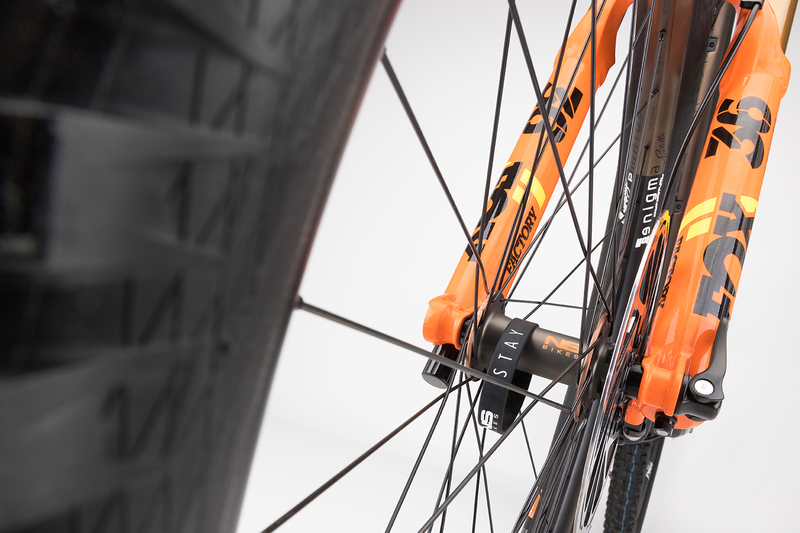 It features unique semi-internal cable routing - the lines are elegantly hidden away, but there is none of the hassle that is involved with standard internal routing. The frame has adjustable geometry: you can adjust the reach via offset headset caps and adjust the height of the BB via interchangeable shock mounts (it’s even possible to change the the travel by swapping the shock and shock mounts). Big sealed pivots keep the frame stable and guarantee long periods of smooth, service free function. There are a few things that we did “borrow” directly from the Snabb - and that is the kinematics of the 4-bar suspension that everyone loves (Pinkbike: "There is so little pedal-induced bobbing at play here that it sort of boggles the mind”), progressive geometry and all-round fun factor.